There's a cold winter brewing inside the blackened heart of Bloomberg reporter Julia Epstein, who tweeted photographs of US forces in Iraq wearing MAGA hats and waiving Trump flags in what appears to be a call for disciplinary action against them for political purposes. 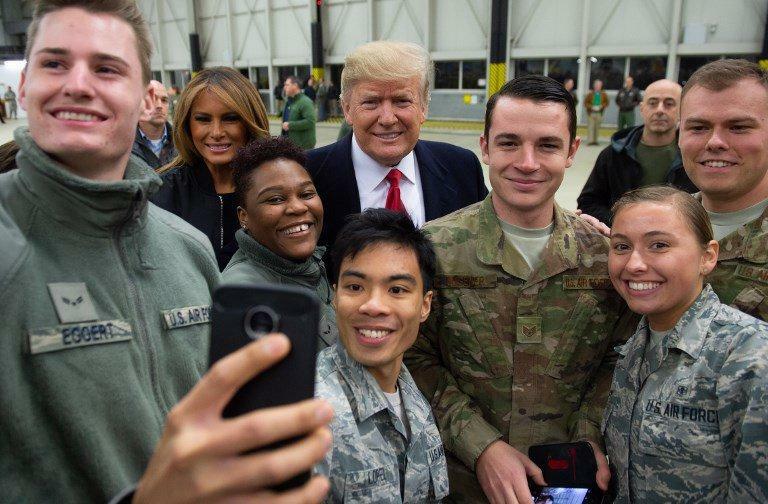 The US forces serving in Iraq were in complete awe of the 45th President of the United States of America, Donald J. Trump. They could be seen wearing MAGA hats, showing off their Trump banners and American flags, and screaming their undying support for the President as he arrived in an unannounced Christmas visit to the foreign land of Iraq to visit America's bravest. Yet, for Jennifer Epstein of Bloomberg News and numerous other liberal pundits on Twitter they saw this as an opportunity to attack the men and women who keep them safe. “Trump flag… she dropped it after she saw me taking a photo,” Epstein tweeted about a female serving abroad. She had the gall to attempt to smear the soldier for showing political support. It's true, US forces aren't allowed to show political allegiance while deployed, nor are they supposed to display civilian clothing such as the MAGA hats some were wearing. Keep in mind President Trump has ended the war in Syria, and promised a 50% reduction of US forces in Afghanistan. This is why #USARegimeChange is trending. What greater gift to America to help end nearly 18 years of seemingly endless war? What greater gift to the armed forces than to bring them home safely? That said, these men and women love America and are risking their lives to defend our interests abroad. Does the media have no shame? And waving campaign gear, in violation of military rules. Just endless attacks against the men. Others on Twitter were quick to note that anyone elected into the White House becomes the Commander in Chief, granting them a historic honor and leadership over the brave men and women of the armed forces. During Barack Obama's visits to troops, there are similar photographs of him giving hugs to the armed forces. Where was the outrage then? The fact of the matter is that the mainstream media are known for their shape-shifting when it comes to criticisms of Trump. What did Jennifer Epstein hope to accomplish by attacking our men and women in uniform? She accomplished little, and further displayed that the President of the United States of America is correct in his assertion that the lying “fake news” media truly is the ”Enemy of the People”, as President Trump often refers to them. Thank you to every American who puts on a uniform and goes into harm's way to ensure that our nation will not be broken and our liberties are preserved. Those serving abroad are all heroes, and the media's disturbing behavior further vilified themselves by way of causing Americans to actually hate the press. To Bloomberg’s Jennifer Epstein, and any media figure who would take out their hatred of Trump on our country's heroes, you deserve no respect. Disgusting. The Bloomberg Reporter is just another anti American hack. These “main” stream reporters still don’t get it! Maybe they work for the CIA in a clandestine way? Perhaps “they” have instruction that are unavoidable to try to mitigate the coming pain which begins January 1st. Either way, it is nice to see the media look like a bunch of political clowns wearing their ( ! ) hats. The person that wrote this article is obviously a partisan Republican hack that doesn't see that these soldiers were breaking rules that everybody has followed for decades. Maybe that’s why every actionable engagement required the presidents approval under the Barry and his killer at the state dept. Hillary. Demoralized troops do tend to get out or say piss on the leaders........funny though....they are not for this president. Instead the spontaneously shout and chant USA, USA. Democrats just don’t get it and never will!